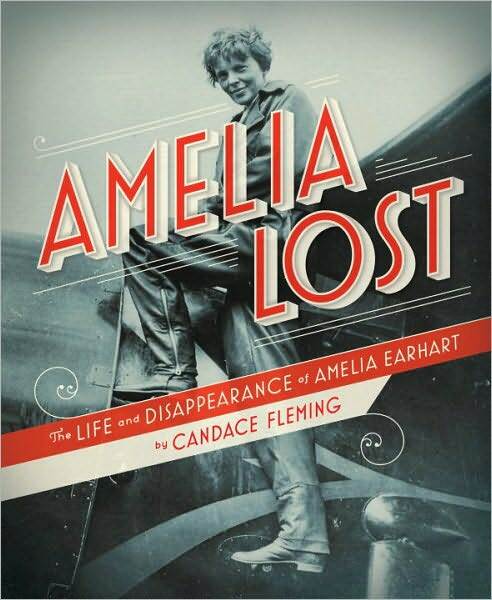 Amelia Lost by Candace Fleming. Viking, 2010. Currently available. Face Value: I have a penchant for all things vintage, and this terrific cover evokes 1930s print advertisements in homage to Amelia’s media heyday. I like it and I think it will look good on a shelf. I am glad that the cover features Amelia standing atop an airplane. It could have been one of those famous portraits of her in the Lindbergh-style aviator cap, but we are fortunate enough to get an image of Amelia standing tall with the machine that liberated her, defined her, and ultimately ended her. Does it break the slate? Yes yes yes! This biography focuses on Amelia’s push to find independence. We see how Amelia persuaded her family to support her aviation career, and how she abandoned more traditional career opportunities to become an aviatrix and media superstar. Admirably, Fleming also addresses Amelia’s progressive views on marriage and her unconventional relationship with George Putnam in a way that is appropriate and clear for young readers. Fleming fully acknowledges Earhart’s feminist tendencies and points out the many ways in which she defied cultural expectations. Who would we give it to? This would be an excellent reading option for those girls who like to break rules or do things that border on dangerous. Amelia’s adventurous nature becomes infectious through Fleming’s biography, and I could easily see a young woman asking for flying lessons after reading this book. I think the best audience for this book is right around the middle school age level. Review: I kept seeing Amelia Lost pop up on Newbery Medal prediction lists around the kidlit blogosphere, and every time I thought, “Really? Nonfiction winning a Newbery? Naaaah.” My library copy arrived and it sat on my to-read pile. And sat, and sat, and sat. Then, in a hilarious turn of events, I went to renew the book and saw that I could not because another patron had placed a hold on it. (Guess who that patron was? My friend and blogging partner, Sarah. Yep. Not joking. Out of the hundreds of patrons using the Tempe library system, Sarah and I somehow always end up right next to each other on the hold list.) So, because I knew that Sarah was patiently waiting her turn, I finally read Amelia Lost…and I was floored. Why did I wait so long to read this fantastic book?! Amelia Lost is masterfully crafted non-fiction for young readers. It’s no surprise that it is getting Newbery buzz. Candace Fleming takes a story to which everyone already knows the ending and still manages to make it fascinating. Fleming consistently builds suspense throughout the story. Amelia’s life unfolds in chapters alternating with shorter interludes capturing the moments leading up to her disappearance. The tension builds around Amelia’s biographical timeline and keeps you turning pages. I could not put this book down. Throughout the book, there are text boxes describing tidbits of supplementary information. Some profile significant people (such as Amelia’s first flying teacher) and some provide historical and cultural context. They are not necessary for comprehending the trajectory of the main story, but they are certainly interesting. As a reader I self-selected and read only the text boxes that I found interesting, and it didn’t negate my enjoyment of the book at all. This biography is unique because it addresses Amelia’s career as a self-promoter. Yes, Amelia was one of the first prominent female aviators, but she’s not the only one. What made Amelia stand out was her dedication to building her media image. Amelia was an ardent self-promoter, and perhaps not always an ethical one. Fleming encourages the reader to think critically about the way that Amelia constructed her image in the media. I loved this element of the book because it ampified its slatebreaking qualities. We learn how Amelia broke the slate using the media as her primary tool, and we are encouraged to think in slatebreaking ways to question how history is documented. We see so many different sides of Amelia in this book – the Amelia who pushed away from her family, the Amelia who was too quick to make decisions, the Amelia who wanted to prove everyone wrong…and more. Candace Fleming creates a wonderfully complex depiction of the famous aviator. Fleming knows exactly who her audience is and writes clearly and directly, with language that is just technical enough to introduce us to the world of aviation without becoming boring. I used to be a big Amelia Earhart fan when I was a child, but my interest waned. This book renewed my fandom. Do not follow my example and let this book sink to the bottom of your to-read pile. Run (now! Seriously, go!) to your local library or bookstore and get yourself this terrific example of non-fiction for young readers. This entry was posted in Middle Grade, Nonfiction, Reviews, Uncategorized and tagged 1930s, Amelia Earhart, Aviation, Biography, Candace Fleming, Feminism, George Putnam, Nonfiction, Women's History. Bookmark the permalink.